Cuisinart prep 7 Cup Food Processor 2019 Review: Is It Worth It? Today you can find dozens of food processors made by several excellent manufacturers like Cuisinart. With the 7 Cup Cuisinart Food Processor, you can slice, chop and shred various kinds of ingredients including meat, vegetables, and cheese. You can also mince parsley and garlic, and emulsify mayonnaise, to mention a few. But how well does this food processor stack up against other Cuisinart models? Let’s take a look at its features and learn what customers have to say about this product. 1 How Many 7 Cup Food Processors Does Cuisinart Make and How Are They Called? 2 What Are The Differences between These 2 Models? 3 How do you use the Cuisinart Prep 7? 4 What Do Customers Say? 5 What is going on with people reporting the Cuisinart prep 7 is not working, won’t start or turn on? 6 Where can I find Cuisinart Prep 7 food processor replacement parts such as the bowl and the blades? 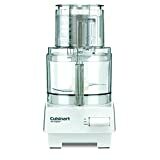 7 What’s The Best Price for the Cuisinart 7 Cup Food Processors? 8 Verdict: Are These Food Processors For You? How Many 7 Cup Food Processors Does Cuisinart Make and How Are They Called? There have been several 7-cup food processors from Cuisinart over the years. But generally speaking they belong to only one of two categories. There’s the Cuisinart Prep 7 DLC-2007 lineup, and there’s the newer Cuisinart DLC-10 designs. The Cuisinart DLC-2007 line has been discontinued, but it’s still available and sales are still strong. The replacement model is led by the Cuisinart DLC-10S, also known as the Pro Classic Food Processor. Though discontinued, you can still get this food processor model in several ecommerce sites such as Amazon. It comes with a 7-cup work bowl, and it’s BPA-free. It also features a one-piece “Supreme” wide-mouth feed tube so you don’t need to slice your fruits and veggies to fit them in. You can just put them whole, since they’re most likely going to fit in the 4.25 by 2.75-inch opening anyway. This Cuisinart Food Processor 7 Cup model already offers many modern touches, such as the Touchpad fingertip controls. It also offers a respectable 500 watts of power. That may not be much, but remember that a food processor works differently from a blender. The Cuisinart DLC-2007N comes with a chopping and mixing blade, a dough blade, a stainless steel 4mm medium slicing disc and a shredding disc, and small and large pushers. When you’re preparing dough, it features an automatic adjustment of the speed to ensure that the dough has good consistency. The disc stem is detachable. The feed tube is located inside the pusher assembly, and it has its own detachable hollow pusher. On its bottom is a very small hole where you can add oil to the bowl when you’re making mayo. All these demonstrate the versatility and usefulness of the Cuisinart DLC-2007N. Not every food processor can do all these things. The 7-cup Lexan bowl is very durable. It’s not only impervious to extreme cold and heat, but it’s virtually shatterproof as well. You can break it if you try really hard, but dropping it shouldn’t give you any problem. It measures 14.5 by 13 by 9.3 inches, and weighs 12.5 pounds. So it doesn’t take up that much space, and the weight makes it easy to transport from one location to another. The parts are easy to clean, all you have to do is wipe down the motor base and put the other parts in your dishwasher. You will also get the plastic spatula shaped for the work bowl. The purchase also comes with the expected manual, which in this case contains plenty of recipes for you to try out. In the past, Cuisinart offered a DVD to help demonstrate its use and to show the recipe preparation, but most sellers these days don’t offer this anymore. The warranty may also depend on the seller, although previously Cuisinart offered a 3-year warranty for the unit and a 10-year warranty for the motor. has very similar features to the DLC-2007N which it replaced. It’s not surprising, since it’s a “classic” and there’s really nothing wrong with its predecessor. The food processor comes with the 7-cup work bowl, and the entire unit is BPA-free. The feed tube is large enough so you can fit in veggie and fruits in their entirety. You also get the medium slicing disc, shredding disc, and chopping blade, and they’re all made from stainless steel. You also get large and small pushers too. The disc stem is detachable, you also get a specially designed spatula, and it comes with a comprehensive manual with lots of recipes. What Are The Differences between These 2 Models? The differences are minor, but let’s just say the new DLC-10s is quite an improvement. The DLC-10s has a more powerful motor at 600 watts, but Cuisinart only offers a 5-year warranty for it. For the entire unit, there’s a 3-year limited warranty. The DLC-10s also used to come with a DVD with instructions and demonstrations for proper usage, so you won’t have to download videos online. But this is no longer offered today. The sizes are of course different, even though the look is in some ways similar. The DLC-10s measures 7.00 x 11.25 x 14.50 inches, so it doesn’t occupy a lot of space. It is, however, heavier at 15.63 pounds, because of its 600-watt motor. So it’s more powerful than its predecessor but it’s worth mentioning that the dough blade is made of plastic. How do you use the Cuisinart Prep 7? If you are having difficulty using your Cuisinart Prep 7, or if you are unsure about how it operates, you have several great options to get you started. First, of course, is the user’s manual that comes with the product. Cuisinart does not assume that you have hours and hours of experience using a food processor, so they have included step-by-step instructions that are easy to follow. This will teach you how to process a wide variety of foods quickly. Or, if you have some difficulty translating the written instructions to actual operation, you can find many wonderful “how-to” videos that will not just tell you how to use the Prep 7, but will show you also! So, if you need to figure out how to use the machine, there are plenty of places to help you out. Most customers are quite satisfied with the two types of Cuisinart 7 Cup Food Processor models. On Amazon the 2007n has an average rating of 4.5 stars, with majority of the reviewers giving it 5 stars out of 5. The newer DLC10s isn’t that far behind at an average of 4.4 stars, and 71% of reviews gave it full marks. While some of the earliest reviews pertain to earlier models, even the most recent reviews for both have 5 star ratings. Many users appreciate its versatility, and quite a few have commented that both models make food preparation so much easier. It doesn’t take as much effort, and it doesn’t take a lot of time either. They especially like the wide feed tube, because it takes out the need to slice the ingredients first before putting them inside the food processor. Its quiet operation is also something that many customers are happy about especially for those who have had to endure noisy kitchen appliances. Many users have also said that it’s very easy to use. Both come with a single toggle switch, which you can control for either continuous or pulse action. And its heavy base ensures it doesn’t move around the countertop when you use it. It’s also very easy to clean. Many have mentioned that the base doesn’t have any crevices in which food can sneak in, so all you need to do is wipe the base clean. Of course, Cuisinart has listened to some of the older complaints which means that nowadays the latest units are much better in terms of quality. Still, it pays to be mindful of the reputation of the seller, especially for the 2007n. Sometimes the unit comes with missing parts and the warranty may no longer be in effect. What is going on with people reporting the Cuisinart prep 7 is not working, won’t start or turn on? You may have read some reviews of people having trouble with the Cuisinart Prep 7 not functioning properly. After looking into this issue, the problems that some people have experienced are not typical. The vast majority of cases in which the Prep 7 will not turn on seem to be simply an issue with proper assembly. If not put together properly, the Prep 7 simply will not function. Be sure to check the instruction manual when putting together your machine. In a rare number of cases, you will get a defective unit (as is the case with any product). Cuisinart is a company with a long tradition of excellent customer service, so you should have no problem getting it replaced for a working model. Where can I find Cuisinart Prep 7 food processor replacement parts such as the bowl and the blades? Cuisinart is a well-trusted company in the food appliance industry, so you can be sure that replacement parts are readily available. You can find many of these parts through secondary sources like Amazon, but if you can’t find them there, Cuisinart’s own website has a vast array of replacement parts for all their products. Also be sure that the replacement parts you are looking for are not covered by the warranty. Many times, Cuisinart will replace your broken parts for little to no cost (possibly just shipping depending on what you need and why it needs replaced). What’s The Best Price for the Cuisinart 7 Cup Food Processors? Since the DLC-10s is not available anymore from the Cuisinart website, the best place to get one at the best price as well is probably Amazon.com. Prices for these kind of products on Amazon get updated daily with deals and promotions so it’s a good idea to check there on any given day, you might find the deal you’ve been waiting for! Verdict: Are These Food Processors For You? The question you should be asking is, do you spend a lot of time in the kitchen? If yes, then either the 2007n or the DLC-10s will be perfect for you. Most people today will go for the newer DLC-10s, since it’s still offered on the Cuisinart website and it has a warranty. But the 2007n still has fans because of its classic design and high-quality motor (which used to have a 10-year warranty). Either way, if you’re excited about trying out new things in the kitchen, then buy any of the Cuisinart 7 Cup Food Processor models. It doesn’t just let you save time and effort. For some, it is THE kitchen appliance that can make them more passionate about food. Insider Review Of The Vitamix 5300: Is It Worth The Price?